For its first production this summer, the Wolf Trap Opera Company is staging Telemann's Orpheus (pronounced, auf Deutsch, "Orfois"), with which I officially inaugurated the celebrations of Ionarts Baroque Opera Weekend on Friday night. The Orpheus story is in opera's DNA, one of the first myths to be made into an opera and, since the genre's birth, perhaps the most often set story. This libretto was created by Michel du Boulay for an opera, Orphée (Paris, 1690), by Louis and Jean-Louis Lully (the eldest and youngest sons, respectively, of Jean-Baptiste Lully). It uses the ancient Greek versions of the Orpheus legend selectively, most importantly adding the role of Orasia, Queen of Thrace, who loves Orpheus and causes a snake to bite his wife, Eurydice. By killing her rival, she hopes to win Orpheus, her court musician, for herself but it does not work out that way. Georg Philipp Telemann (1681-1767) was one of the longest-lived and most productive of the major late Baroque composers, a giant in reputation during his life, always considered to be the first choice for any new music position in Germany (far above J. S. Bach when the Leipzig job came open). Listening to his music is generally full of rewards, although in some cases, much as with Vivaldi, you can tell that he was under a pressing deadline and just phoning it in. In addition to a large amount of sacred and instrumental music, he staged a number of his own operas while he was music director of the Hamburg Opera (from 1722 to 1738). Reflecting the cosmopolitan nature of the Hamburg audience, Telemann's Orpheus (produced first in a concert version in Hamburg in 1726) combines a mostly German libretto with some pieces in Italian and French, the latter probably just left untranslated from the original libretto. When he finally staged the opera in Hamburg in 1736, he renamed the work Die rachgierige Liebe, oder Orasia, Königin in Thracien, reflecting the reality of the work, that is, that its main character is neither Orpheus nor Eurydice, but Orasia. The score was lost until its rediscovery in 1978. The work was finally brought back to the stage in Eisenach in 1990, but it was really the productions conducted by René Jacobs, at Innsbruck and then the Deutsche Oper in Berlin in 1994 and 1996 that made this opera known again. On the excellent recording made by Harmonia Mundi in 1996, René Jacobs led the Akademie für Alte Musik Berlin (who gave a stupendous concert at the Library of Congress last year). Tim Page wrote an article in the Washington Post back then (no longer available online), praising the recording from earth into heaven when it was re-released in 2003. The superlative cast includes Roman Trekel and Dorothea Röschmann. 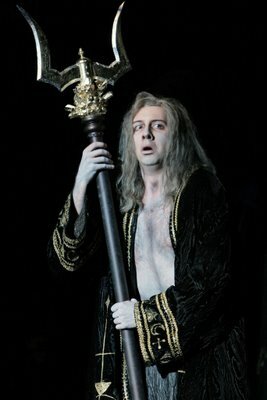 Also impressing with vocal power was bass Matt Boehler, who dominated the second act as Pluto, ruler of the underworld (shown above) by his towering height and strange presence. 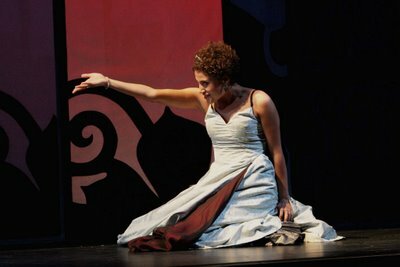 Soprano Evelyn Pollock, who was both Eurydice's friend Cephisa and the priestess of Dionysus, returns to Wolf Trap this summer after an outrageous turn as one of the wicked stepsisters in last summer's La Cenerentola. She has a more dramatic soprano voice, with greater heft and yet impressive agility, for example, in Cephisa's Act I aria "Ich weiß von keiner Liebe nicht." Dark-toned mezzo-soprano Ronnita Miller was a memorable Ascalax, wielding a whip over the minions of the underworld, and clear-voiced Maureen McKay was wide-eyed and pure as Orasia's servant Ismene. Baritone Alexander Tall sang well in the principal male role of Orpheus, with a rounded tone and vibrato perhaps one notch too active. The orchestra was generally fine, with a few problems in rhythmic ensemble, dropped notes, and intonation. Conductor Guido Rumstadt, from the Regensburg Opera, helped the players and cast recover from a few scary moments. (It would have been easier, however, to hire Ryan Brown right here in Washington, especially since many of the string players in the pit were from his group, Opera Lafayette. The result may have been more baroqueux.) The sets were nicely done by Martin T. Lopez (the company's director, Kim Pensinger Witman, wrote in her blog about how the set for the underworld scenes attracted a bat when it was installed. However, Lopez's costumes mostly left much to be desired, especially the white tuxedo jackets and slutty wedding outfits the women wore at the nuptials of Orpheus and Eurydice. The (intended?) class distinction between the regal Orasia and the rest of the cast, however, did bring into relief one of the interesting subtexts of the opera for 18th-century composers, Orpheus's complaint about having to serve at the beck and call of his court employer, Orasia. This is a gutsy choice for Wolf Trap, an apprentice company that selects a group of talented young singers each summer, staging operas starring them and giving recitals at its bucolic wooded campus out in Virginia. I am glad that they decided to shake things up with something Baroque and rare this summer. They did the financially sensible thing by having these performances in the Barns, which was not quite full on Friday night. There is sadly probably not enough interest in Baroque opera for Orpheus to sell well enough at the Filene Center. Just as well, since I confess that I don't like the outdoor venue very much as a place to see opera anyway. The Barns was well suited to the intimate nature of this opera. Keep up with the inside news about the Wolf Trap Opera company with director Kim Pensinger Witman's blog, which I enjoy reading. Also, for something tangential, check out Rainer Maria Rilke's Sonnets to Orpheus (1922, translated by Howard A. Landman). There are three more chances to hear Orpheus at Wolf Trap: this afternoon (June 18, 2 pm) and next weekend (June 23, 8 pm; June 25, 2 pm).